The death toll arising out of the cholera outbreak among Congolese refugees in Hoima District has reached 26, as officials struggle to dealing with the increasing refugee numbers. 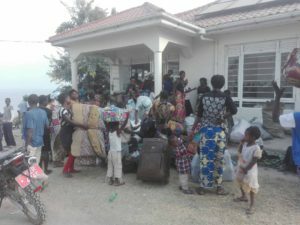 The disease, which is believed to have originated from eastern DR Congo where the refugees are fleeing tribal fighting, was first reported in Kyangwali settlement camp and at a reception centre at Sebagoro Landing Site near Lake Albert on February 15. And according to officials, the disease, which manifests in form of acute diarrhea, vomiting and severe dehydration has so far killed 26 people and seen more 456 cases isolated, further complicating the team’s efforts to handle the ever increasing daily arrivals into the country. According to Ms Duniya Aslam Khan, of the spokesperson of UNHCR in Uganda, “all reported cases and all victims are newly arrived Congolese refugees,”. According to Dr Joseph Ruyonga, the Hoima District health officer, they are currently working with officials from the World Health Organisation, UNICEF, UNHCR and Medicines sans Frontiers to contain the epidemic. According to Ms Jolly Kebirungi, the commandant of Kyangwali refugee resettlement camp, their united efforts have so paid off, adding that efforts are now concentrated on community education, water purification and treating the sick. Bunyoro sub-region is currently grappling with big refugee numbers who are fleeing from a tribal conflict between the Bagegere and the Lendu in Ituri province of DRC. The most affected DRC tribes are the Hema, Bagegere, Kebu, Lendu and the Alur. Disease surveillance experts have said areas where the Congolese are fleeing had a cholera outbreak. In total, violence in eastern Congo has uprooted 200,000 in the last two months, according to aid workers.